straight toque with tami,eh? 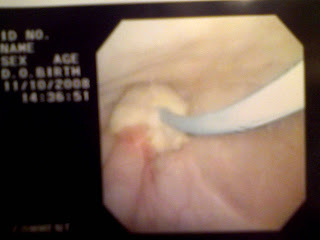 : Warning: Gross but cool! body following my tumor surgery. First let me say...I have never been more NERVOUS in my entire life. I'm sure it was because I had no idea what to expect. So, let's take a look at the first picture. This was the first instrument I saw when I walked into the room. 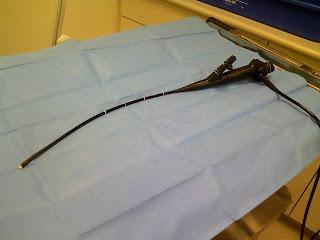 It is the tool that the doctor inserted into my yingyang. The white tip on the end is actually a camera. 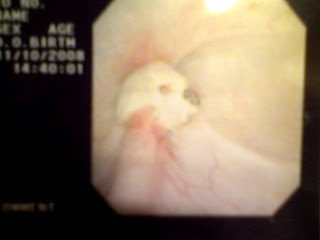 It takes pictures as it moves through the ureter. In the next picture you can see the monitor that shows the pictures. I was able to watch it all as it happened. There was also a long metal pick type thing inserted through the instrument. On the end of the wire was a little "pincher" that grabbed the stent so the doctor could pull it out. The stent is out. The black dot is actually a suture. Dr. Lee said that Dr. Soissen did a great job with the reconstruction. I'm really not sure what went on in there and I'm not really sure that I want to know. I was bold enough to ask the doctor if I could have my stent. His nurse cleaned it well and put it in a container for me. 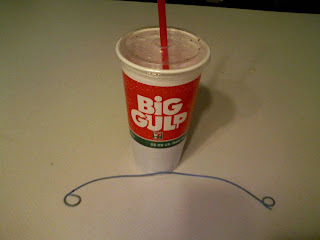 Here it is next to my Big Gulp. I had no idea how long it was. The whole procedure lasted about 10 minutes. IN FACT (and this is hysterical) Terry missed the whole thing because he left to get me a Diet Coke from the cafeteria. We had been told that Dr. Lee was still in surgery and wouldn't be done for quite some time. In fact, the nurse didn't even have me get ready. So, we thought we had plenty of time for Terry to run for drinks. So, they gave us a copy of the pictures so Terry could see them. OMG, you are killing me! 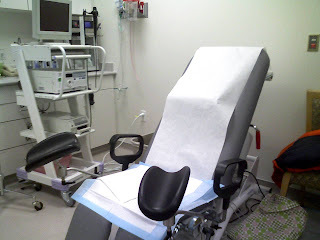 I think I have so stop reading your blog until after my surgery. I am so creeped out right now. That really Is big! You weren't exaggerating! I believe that part of the body is called the icky-au-casus, but you know I'm no doctor I wouldn't quote me on jeopardy or Family Feud whatever the situation. Glad to see that you have are foreign object free. It's like all trade barriers were removed in your body... yay NAFTA. Oh Tami! You really went through quite an ordeal! I am so sorry for all that you have gone through. I am glad things are getting back to normal for you. And just in time for the Holidays! Yay! That thing is huge! AHHH! You are such a good sport, Tami. And don't say yingyang or I might pee my pants laughing. HOLY MOLY!!! It's no wonder you could feel that sucker! Sheesh.